This new video just uploaded to the Art In Wax YouTube channel shows me painting in my little studio area here in Southend. I introduce myself and then give a brief walk around my studio set up for the day and then paint a picture of some lavender flowers. 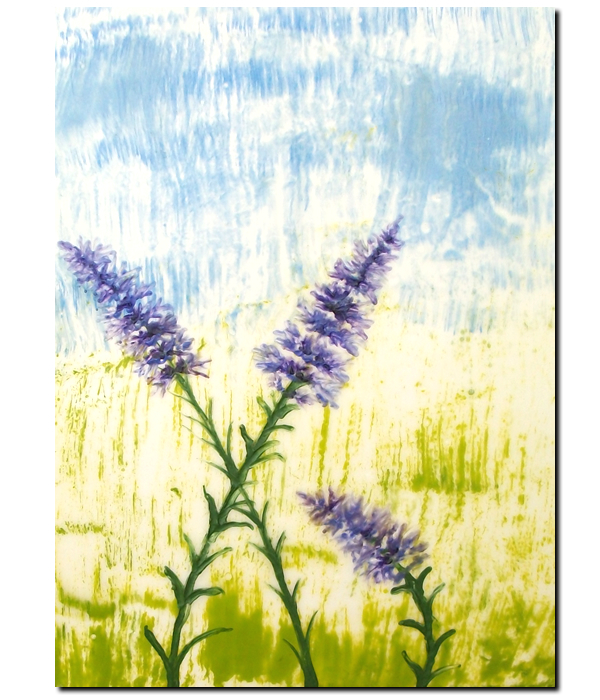 Encaustic art comes in a very wide and varied range of styles. It is a wonderful medium to work in and artists around the world use many different types of wax and with many different styles and techniques of working which all fall under the umbrella of “Encaustic”. I myself work in different ways with wax. In fact I use two different types of wax and different supports and styles when working in each of these waxes. When working on gloss card I use a wax paint that is suitable for this support and when working on, wood panels and absorbent supports, and the Ampersand Arts Encausticbord as in this video I use the wonderful handmade paints of R & F Paints. I first started using the R & F paints last year when I reviewed their Encaustic starter kit and blogged about it : www.artinwax.co.uk/blog/encaustic-starter-kit-review/ and since then I have lots of their wax and love to work with it, when working onto these supports and with this formula of wax I layer the wax and fuse between layers, the effects are amazing from strong colours to misty effects when clear wax is layer over colour to give depth and softness. I also love working in more of a free and abstract way with the deeper layers, using hot air to move and form the wax and layering to create pieces of art just a bit different from my other work !!! Pieces of Art In Wax in both styles are available to buy online via my online store : Shop Art In Wax. If you don’t see a picture you are looking for in the shop please contact me. This is video …. please leave me comment and let me know what you think. You can watch me paint in more videos on the Art In Wax Demonstrations page. This new seascape painting started out as a demonstration for my youtube channel, following a suggestion from a fellow encaustic painter Dallas, of Abounding Treasures in Canada who saw one of my boating seascape paintings on the Etsy website and having already watch a couple of my encaustic art video demonstrations, commented that it would be good to see how I painted a boat in hot wax. I have been waiting for an idea to come for a new video, we have such fun making these short films but thinking of a subject is difficult so when this suggest came I thought I would run with it and this is the resulting painting. 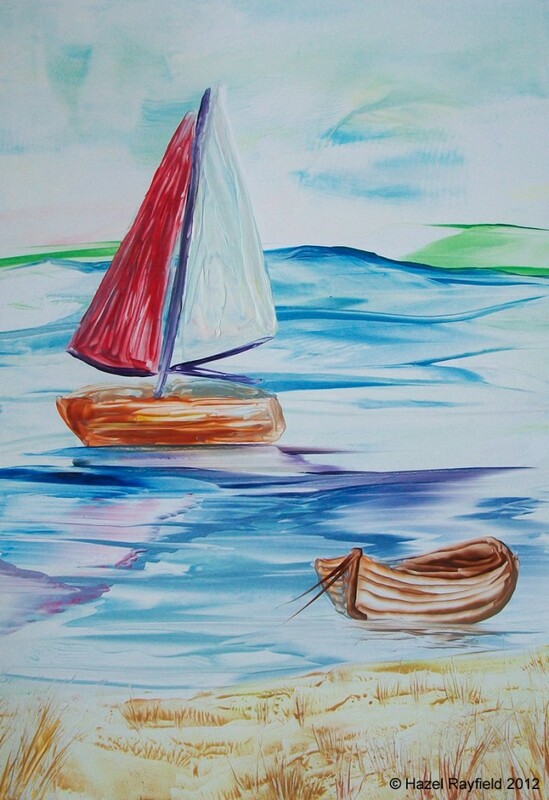 You can watch me paint part of this picture on my youtube channel : Sailing Boats. We could only show part of the painting in this demonstration, which is nearly 6 minutes in length and one of the longer films we have made. It took a lot longer to complete the painting than would have been practical to film. Many of my paintings take several hours to complete depending on the size and detail involved. This demonstration is based on the sail boat part of the picture, I then added the shadows giving the reflection of the sails in the water, added a small dingy to the foreground and some grassy beach as the land. I used some bronze and gold wax in the beach which gives just a little more shimmer to the painting. It is always hard to know where to stop with a painting I find, I could have carried on with this picture, adding detail to the horizon and creating more depth to the water and waves, perhaps adding some birds in the sky or a fence in the foreground, but it is also sometimes wise to stop and keep it simple ……. What did you think? is there anything else you would like to see me paint in hot wax? Why not leave me a comment …….